VisionDirect.com.au is Australia’s largest online designer eyewear store offering the best online prices for the worlds top brands such as Ray-Ban, Maui Jim, Tom Ford, Bvlgari, Spy, Gucci and many more. If you shop for designer sunglasses or prescription glasses – online eyewear retailer Vision Direct is a fantastic destination. Don’t miss the opportunity to save with discount codes when shopping for eyewear with VisionDirect. Note: Frames are not included in this coupon offer. Why shop eyewear with Vision Direct? Have you always paid a fortune when you purchased new designer sunglasses, glasses or contact lenses? At Vision Direct you find an amazing large range of eyewear at the best price possible. That’s where Visio Direct’s Best Price Guarantee comes in place in the following way: If you see items marked “Best Price Guarantee” and find a better price on eyeglasses or sunglasses elsewhere, send customer support an email providing the website address of the lower-priced item. If it happens to be the exact same model number and colour, VisionDirect will match the price! Note: Please, read the Best Price Guarantee guidelines carefully when claiming your guarantee. We advice you especially, that Best Price Guarantee does not apply with any coupon codes, rebates, gift certificates and the like. Besides this fantastic offer to always be assured of paying the best price on designer eyewear, consumers find several more reasons to shop with Vision Direct. There’s this useful virtual try-on feature, which makes it easy to check if the desired item actual matches your face. Also, a style finder guides you through the enormous range of products available as do various shopping guides and the ‘shop by personality’ feature. Oh, and of course all products are 100% authentic and sourced from original distributers! Shopping eyewear at Vision Direct generally is a safe thing to do. At the time of writing, the average store rating at ProductReview.com.au is a respectable 4.0 stars out of 5 stars. There are quite a few complaints and 1-star-ratings, though. Often they refer to longer delivery times than expected. On the positive side we note, that Vision Direct’s customer support seems to answer nearly every single complaint on the platform. There’s a different picture on eStoreReviews.com.au regarding Vision Direct. Meager 2.2 stars out of 5 stars paint a rather negative picture of the online store. However, there are 5 reviews only so far. That’s way too less to be statistically relevant. A fantastic rating Australian online shoppers give Vision Direct at trustpilot.com. Here we find an overall rating of stunning 9.3 points out of 10. Over 92% of the consumers voted for at least 4 out of 5 stars there. Again, Vision Direct’s customer service seems very active on commenting and reactings to complaints and negtive ratings on trustpilot’s platform, too. How to save with Vision Direct coupon codes? To save with Vision Direct discount codes when shopping for glasses, sunglasses, and contact lenses, copy the promo code you find at CouponDeals.com.au to your clipboard and hit the button directly connecting you with the Vision Direct website. Once you’ve put all your items in your shopping cart and proceed to checkout, notice that little hint saying ‘Have a Discount Code, Gift Card or Referral Code? Please click here.’. Hit the appropriate link and see a promo code form appear. Enter your promo code in the first line saying ‘Discount Code’ and push ‘Update Total’ button and there you go. Happy saving with CouponDeals.com.au promo codes! 50% discount on all LMNT, Arise Collective and Oh My Woodness! Stockpile your lenses supply: 30% discount on all Prescription Lenses! Get $15 discount if you buy products worth $200 and more! Get 7% discount on all glasses and sunglasses from Vision Direct! Enjoy 30% discount on prescription lenses with our promo code! 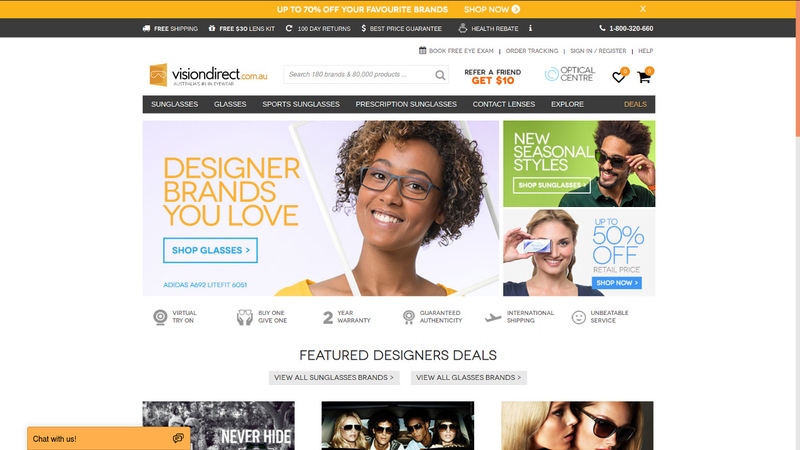 Get 7% discount on all glasses and sunglasses from Vision Direct's website - including discounted ones! Don't miss a great saving opportunity if you wear contact lenses! Save 7% when purchasing any glasses and sunglasses - incl. discounted ones! Our Vision Direct coupon code will provide 7% discount + free shipping to all glasses and sunglasses displayed on their website, including already discounted ones!